Marinate Pro WordPress theme is a perfect solution if you want to start a food blog or a photography blog or just want to show case your portfolio. Marinate is fully responsive and suits any screen size, so that every visitor enjoys a great user experience and beautiful design of your website. Marinate is compatible with WPML. This allows you to conveniently customize and manage your website no matter what language you speak. 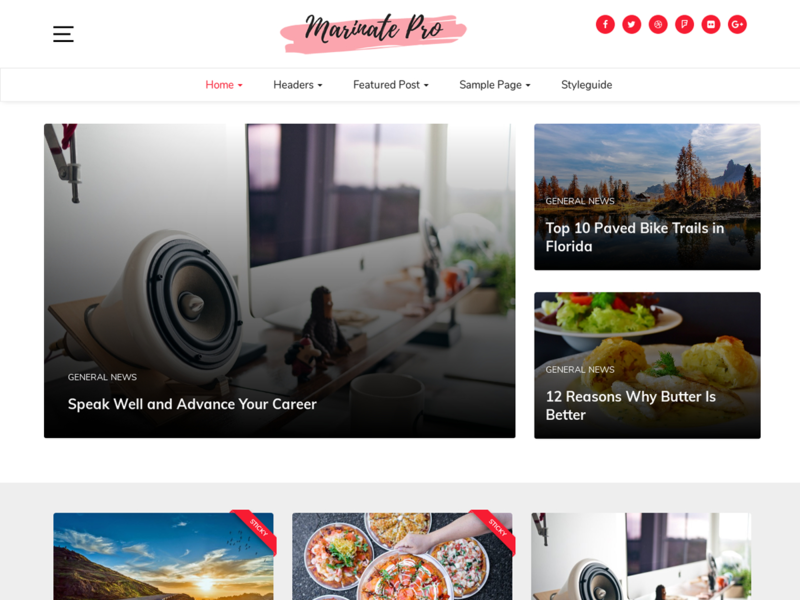 Marinate Pro WordPress theme is a perfect solution if you want to start a food blog or a photography blog or just want to show case your portfolio. Marinate Pro comes with grid like layout for its Homepage and full width featured image for single posts which is perfect to showcase your high-res photos. Marinate Pro also has an inbuilt off canvas widget area which works on desktop, mobile alike. Marinate Pro is best theme for personal, lifestyle, food, travel, fashion, corporate, photography and any other kind of amazing blogs. It is very easy to use even for WordPress beginners. Clean, modern and responsive, marinate is perfect to showcase your content on any device.